Rancho Los Banos -- Right for You? Is Rancho Los Baños Right for You? Rancho Los Baños is not a typical Dude Ranch nor a Resort! We are not for everybody. We consider ourselves an adventure guest ranch. We are located in vast, remote and pristine wilderness, far removed from air, light and noise pollution. Indeed, there are few pristine areas of land, like the Rancho, left in North America. Because of this, the relaxing, healing, reenergizing and de-stressing qualities at the Rancho are fantastic. When here, we ask that you leave some of the comforts of home behind and embrace a more back-to-nature, slower, slightly more rustic lifestyle that embraces our surroundings, and our dynamics. While we certainly offer comfort and quality in our accommodations, the definitions of fancy, luxury or being pampered to do not exist here. Our gift store is nature, our souvenirs a collection of memories, photos and fun. We are a real adventure destination, a genuine Mexican cattle and guest ranch providing excellent service, food, accommodations and hospitality. We are in the wilds of the Sonoran desert, at the foothills of the Sierra Madres, far removed from cities and modernity. Many rides and hikes traverse rugged uphills, downhills, cliffs, mountains, ravines, grasslands, canyons and rocky river beds. When it comes to riding, though, this is the Major Leagues, a world-class and one-of-a-kind horseback riding experience, offering diverse and spectacular scenery not seen anywhere else in the Americas. Our canyons, unique, exotic, otherworldly, highly entertaining and pristine, offer awesome day hikes, and constantly remind guests of scenery out of Hollywood movies. The vastness of the land is unique, [one can see for miles on end] and distances from place to place can be far apart due to rugged land and roads, even in cars. At the Rancho, because of our topography, there is minimal cantering; the challenges and fun are presented in many other ways, in conquering this rough land along with your horse, in discovering and learning about yourself, in overcoming obstacles and challenges along the trail. Guests with a fear of heights can struggle at the Rancho, both on rides and hikes, as well as on our dirt roads. Our roads hug cliffs looking down hundreds of feet. They curve through mountains and look down on canyons. For most they are thrilling and fantastically scenic; for those with a fear of heights, they can be quite uncomfortable. Our accommodations are located in the heart of the desert, in an off-the-grid location. We are not, therefore, afforded the comforts of daily living as we are not located in a first-world city. We run on solar power, so energy must be conserved. We use propane tanks for hot water boilers, so showers are at certain times of day. We depend on well water for bathroom use, relying on gravity for water pressure, so pressure will not be the same as that of the cities. In winter rooms will be cooler than your home, as we only have small propane heaters, fireplaces and wood stoves for heat. Occasionally small insects may make their way into the lodge and cabins, though we do our best to keep them out. We clean and maintain our accommodations very well prior to your arrival, but oftentimes, as is typical in the desert, dust makes its way into your room. Also remember that we are in desert wilderness, hours from civilization, so when a car gets a flat tire, or a toilet stops working, or a certain food staple runs out, patience is needed. We cannot simply run to the local convenience store, or call an emergency plumber, as the nearest town is a two hour drive each way!! Because of our remote location there is no Internet and quite limited cell service at the Rancho, and no energy capacity for blow-dryers or curling irons. Remember...we are NOT a resort, so please do not expect luxury or all the comforts of home, the city and modernity. However, we do want to make your stay enjoyable, and our hospitality and service is second to none. Our accommodations are comfortable, clean and spacious. If you expect five-star treatment and accommodations we ask that you look at other ranches that do offer what you seek. At the ranch you will be quite comfortable during your stay, and for the most part we have all modern conveniences, but please be aware that we are located in a pure wilderness setting in the heart of the Sonoran desert and all of modern life cannot be brought here. What we are is a real, genuine, unique and fantastic guest ranch experience, one filled with thrills, adventure, challenge and education. Our Rancho takes you out of your comfort shell, away from your bubble, and into an awe-inspiring world of wilderness and nature-filled magic. Here you escape the wired world and enter the natural world. We cannot offer a five-star resort, but we can offer a billion star view. At the Rancho our kid guests thrive, grow, learn and discover. Here the benefits of nature reenergize and rejuvenate both body and mind. Here, you will feel at home, and like family. Because of this we are visited by over 200 guests a year. If you are looking for a desert guest ranch resort that is sanitized from its surroundings and its reality, one that is artificially created ... then we are not it! We are the real deal, far removed from today’s dude ranch experience, always placing people over profit, quality over quantity, an adventure guest ranch for 21st century adventure and active travelers. 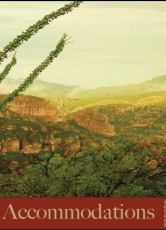 If you are looking for a unique and natural setting in the heart of the Sonoran Desert, where wilderness meets adventure and vastness meets incredible scenery, where nature meets serenity and education meets fun and thrills, while you experience a true desert adventure found only in Sonora, then perhaps WE ARE JUST WHAT YOU ARE LOOKING FOR!